Dealing with any legal process can seem daunting and difficult, especially personal injury cases wherein the claimant has to deal with his or her injuries and losses. Though each case is different, there are a few steps that personal injury cases have in common. Here’s a short and general timeline of how a personal injury case progresses. The first thing that happens in any personal injury case is, of course, the injury itself. Personal injury is an area of law that focuses on bodily injury to a person, as opposed to property. Common areas of personal injury include car accidents, slip and fall accidents, medical malpractice, and product liability. The injured party should always seek medical attention for his or her injuries. 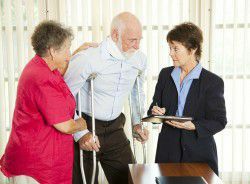 The next step in a personal injury case is that the injured person hires a lawyer. Though only a very small number of personal injury cases actually go to trial (between 4% and 5% of them), people who are navigating a personal injury claim will almost always benefit from the expert counsel and representation of a personal injury lawyer. Lawyers are usually essential for getting adequate settlement compensation. After the lawyer has been hired, he or she will begin the investigation of the case. This means that he or she will interview the injured person to glean as many details as possible about the case, the injury, and all of the details surrounding them. He or she will also look over medical bills and records and begin preparing a case. After the lawyer has conducted his or her investigation of the case and gathered as much information as he or she needs, the negotiation with the insurance company and the liable party will begin. The lawyer and the insurance company will negotiate the amount of the settlement, which covers the expenses and losses experienced by the injured person as a result of the injury. From here, the case will go one of two ways. Either the settlement will be of an acceptable amount and the case will be settled and the injured person fairly compensated, or the case will go to trial. If it does go to trial, there are a few more steps to the process. In the personal injury lawsuits that do go to trial, only 50% of plaintiffs win. Again, each case is different, but this is more or less how personal injury cases will progress. It’s important to remember that there is help out there and that a person never has to go through it alone, and that personal injury lawsuits aren’t as common as one might think.